Line a baking tray with parchment paper or a cookie sheet. In a large mixing bowl, combine all your ingredients and mix until well combined. Form small balls on the cookie sheet, spread 3-4 inches apart. Press each ball into a cookie shape and press down with a fork. 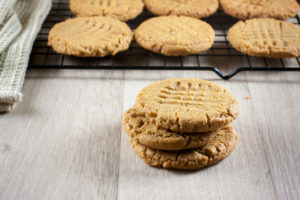 Enjoy the Almond Butter Cookies!